​What day does my garbage get picked up? What is my zone for junk and brush? Get a can: Each can has a one-time maintenance fee of $70. To order a new can, contact Customer Service | 865-273-3456. ​Get an extra can: If one can is not enough for your household waste, a second one can be ordered through Customer Service. Second cans may be relocated to a new address if the homeowner moves inside the Maryville City limits. However, you must contact the Sanitation Department | 865-273-3302 to officially transfer the can. Transferred Ownership: Cans are associated with addresses. When a home is sold, the can should remain with the home. No other action needs to be taken. If the can was taken from the address, a new account will need to be set up following the directions above. New Construction: Contractors/ builders typically pay for new cans with their permit fees. Trash cans are delivered to new homes after occupancy begins - cans are not delivered until occupancy to prevent theft/ vandalism. Call 273-3302 to verify your can has been paid for. If not, you can pay for it by following the directions above. Missing or Stolen Can: Contact us at 865-273-3302. Cans are marked with serial numbers and assigned to specific addresses. Crews will investigate and the Superintendent will contact you if the can is located. Replacement cans must be paid for by following the directions above. The City is replacing its old-style garbage cans with new ones. If you notice neighbors with new cans, it may take up to three weeks to replace all cans in your area. Leave your can out until 2 p.m. on pick-up day if you notice your area's cans being replaced. The City uses automated python trucks to collect trash in most areas. These units offer a safer working environment for employees and efficient operations using just one crew member per unit. It also allows us to use the extra manpower for other sanitation efforts including can repair and junk/ brush pickup. Can must be placed with the lid opening facing the street. The wheels should be to the home side. Place garbage can at least 3 feet from any tree, pole, mailbox, other can, etc. If possible place can on opposite side of drive from mailbox. Place can at least 10 feet away from any parked automobiles. Can lid must be closed completely. The Sanitation Department will only pick up the can assigned to your residence. No other bags, cans or containers will be picked up. Cans must be at street by 6 a.m. on pickup day. Do not stack anything on top of or around the cans. Multiple cans must be spaced 3 feet apart. Per city ordinance: All garbage must be placed in plastic bags suitable for garbage and securely tied. Bags must be of adequate quality. The City provides curbside pickup of household junk and brush on a monthly basis. Placement time: Place junk/ brush items one day before the zone collection begins. If items are not placed at the curb before the truck comes through, it will not be picked up and the items will need to be removed until the following month. 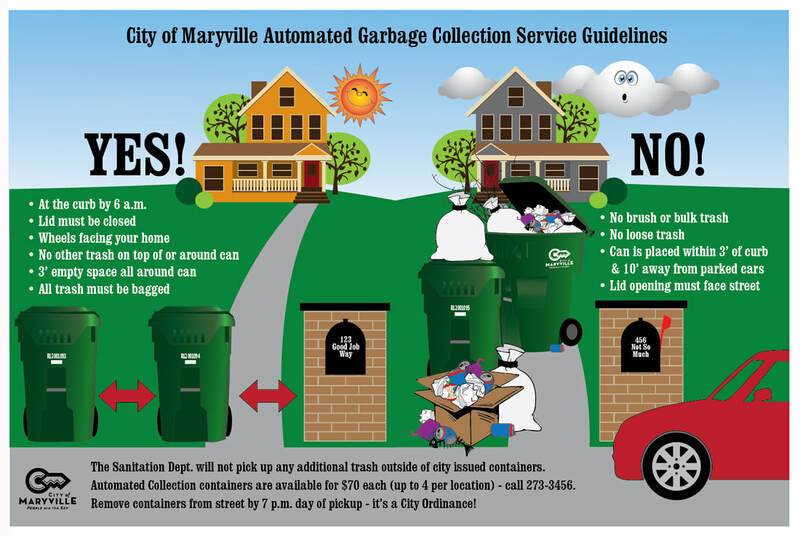 City ordinance requires junk cannot be placed at the curb more than three days before the zone collection begins. BLUE, GREEN, RED, and YELLOW and pickup occurs every month. ​The process for picking up bulk and brush in the City provides a convenient way to dispose of brush and junk for residents. However, the process may have some drawbacks. Brush pickup equipment is not surgically precise. The equipment in service since 2011 has a larger bucket than previously used. The larger bucket was required due to the increase in materials and the need for a more efficient tool. The larger bucket is heavy and yard scraping is often unavoidable. This can be especially dependent on factors such as slope, proximity to the ditch, if the ground is wet, and if the material is scattered/not stacked properly, or if there are a lot of small pieces. While using the service can result in yard scraping, the crews attempt to keep scraping to a minimum. If it appears the ground has been damaged significantly, contact us at 273-3302. If there is significant damage, crews will repair and reseed the area. Items not picked up at curbside are: construction, remodeling, building materials, chemical hazardous waste (liquid paint and other chemicals). Boxes should be empty and flattened out. Residents should always separate brush from household junk. “Clean wood” or wood that is not contaminated with household or construction waste can be sent to recycling at a lower cost. If items are mixed with brush, it all has to go to the landfill. During or after storms, trees may be uprooted. Residents who contract to have the stumps moved to the curb should request the stump be cleaned of the dirt around the root ball. This can be done by shaking or dropping the stump to dislodge dirt. Dirt is heavy and adds significant cost when sent to the landfill. In some cases, the root ball may be too heavy for the truck to pick up if the dirt has not been removed. Our knuckle boom equipment has a maximum lift of 1500 pounds. Anything heavier than this will require alternate arrangements by the resident. Tree trunks and limbs can be no longer than 12’ (twelve feet) to fit within the truck bed. Junk and brush piles must be within 12’ (twelve feet) of the curb for the truck to reach. Ensure junk and brush placement does not create a sight block for traffic. Ensure junk and brush is not in the roadway or in ditches which can block stormwater flow. Do not place junk and brush near electrical boxes, phone boxes, fire hydrants, and power poles. Tires (removed from rims/wheels) may be placed at the curb in a separate pile. No more than four (4) tires at one time, and no more than 12 tires per year per location. Need a junk trailer/ dumpster to dispose of large quantities of junk, construction material, etc.? $150.00 plus landfill weight (tipping) fee for the first four (4) days. Each additional day $40.00 per day. Residents and property owners must show driver's license with current address or property tax statement. *Plastic bags such as trash bags, grocery bags, food container plastic bags, plastic wrap, cellophane peel-off lids, other light weight wrappers. Recycling your tree will help save space in the landfill, provide fish and wildlife sanctuaries, as well as mulch for our area parks!